Most people never heard of Camio. It’s a cloud recording service similar to Nest Aware. It also has the ability to work as a similar service for your iPhone, smartphone or tablet. Potentially this service is a good way to turn your old smartphone into a home security camera. I’ll write more about that another time. This article is about using Camio with a Nest Cam or DropCam. Should you try Camio? Is it better than Nest Aware? What’s it cost? Let’s take a look. Camio is a cloud based video recording service. The service allows recording of live video using a Nest Cam, DropCam, IP Cam and any iOS or Android based phone or tablet. The service provides motion-triggered zones which are similar to Activity Zones on the Nest Aware service. Camio has a learning mode which enables the service to differentiate over time the validity of motion alerts. There’s a smart search to help you look for particular events in your video history. Most of the stuff that can be done with Nest Aware can be done by Camio. Interesting pricing model. If using the service to simply enable streaming on a spare smartphone or tablet, it’s free. I suppose they look at it as a gateway into an eventual pay service. If using Camio for a home security camera such as a Nest Cam or DropCam Pro, there is a monthly subscription fee. A 30-day video history with Camio Daily, search and alerts carries a monthly charge of $9.90. Their Advanced Service gives 90-days of storage plus advanced video analysis for a cost of $19.90 per month. Nest Aware charges $10 monthly for 10 days days of video and $30 monthly for 30 days. Adding a second camera to Nest Aware saves 50%. So, at least for the first camera, Camio provides more value for the fee. In my particular case, I used a DropCam Pro that I use to watch over my front door of my home in New Jersey. The camera is seated over the door looking out through a window above the door. That’s what you see in the accompanying photo. It was raining fairly hard the night I saved that photo. The screen capture that you see was the last few screen captures. 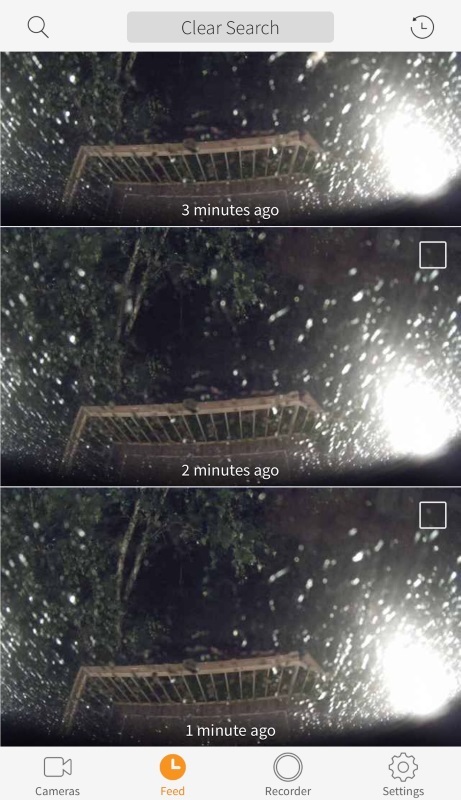 All motion generated because of the rain drops you see on the window. All of that was done in about five minutes. Not bad. So after I got the initial impression out of the way, it was time to explore the advanced functionality. I was most interested in their motion-triggered zones. I quickly found out that all of this needs to be done from my browser, not from the app. That was a bit disappointing. So off the couch I went to my home office. So to setup a motion-triggered zone, you use the browser to draw an area around where you want Camio to pay attention to. The purpose here is to minimize false motion alerts. So in my example, I don’t want motion from the trees to trigger an alert. I do want motion from a human walking up to my door to trigger a motion event. So I highlight the area in front of the door. That’s the area that the service will pay attention to. I also want Camio to learn the difference between a valid motion event versus one I don’t care about. There is a thumbs up and thumbs down associated with each event that is captured. I had limited success with the learning function making a difference in false alerts. Camio has an IFTTT channel. For those unfamiliar with IFTTT, it’s a service that allows integration of hardware and software. IFTTT is an acronym for “If This Then That”. It allows you to do some cool stuff such as turn recording on or off based upon time of day or an event. It also allows you to log all events to a Google Spreadsheet. There are a lot more things that can be done, be sure to visit the Camio IFTTT Channel. Besides pricing, there are some important differences between the two services. To me, the most important is motion detection. While both services support motion zones to minimize false alerts, the Nest Aware service seems to be more accurate. Perhaps as Camio learns more, it will be more accurate. The Camio search function isn’t easy to use and quite frankly, I abandoned trying to figure it out. Lastly, the Nest Aware service is integrated into the Nest App and I can do more on the app versus the Camio app. So which is better? Functionally, it’s Nest Aware. However, you do get more for your money with Camio plus it can be used for other devices besides the Nest Cam and DropCam. For a deeper view of the Nest Aware Service, be sure to read Should I Subscribe to the Nest Aware Service?